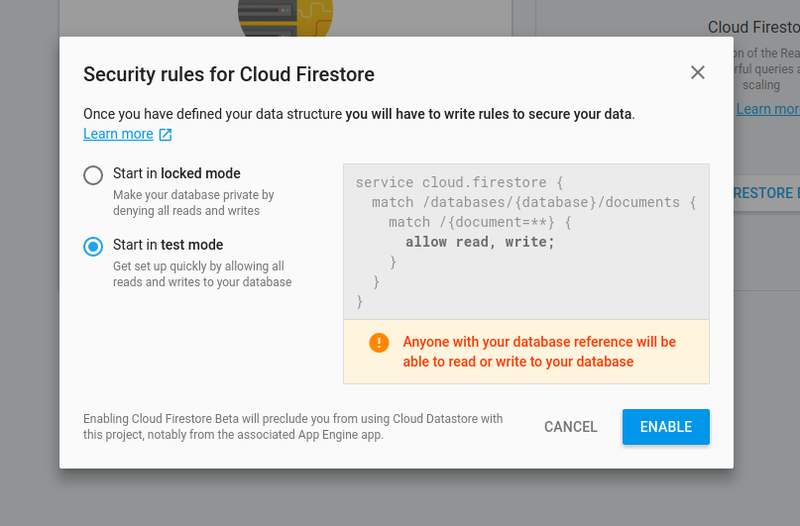 A few weeks ago, Google has released its new solution for building scalable cloud databases — the Cloud Firestore. It has some nice improvements in comparison to their previous database (which used to be called Firebase but is now referred to as ‘Realtime Database’), like better data structuring and a more powerful querying API. In this post I’m going to go through everything you need to get started with Cloud Firestore in Angular with the official AngularFire2 library. So let’s get started! Next thing we need to do is install the necessary packages and tools for our project. In the first line we installed Firebase package itself plus AngularFire2, which is a wrapper that adds some neat Angular-specific features to Firebase. Those packages also include things like Firebase Authentication, Hosting etc. but for now we’re only concerned with Cloud Firestore. 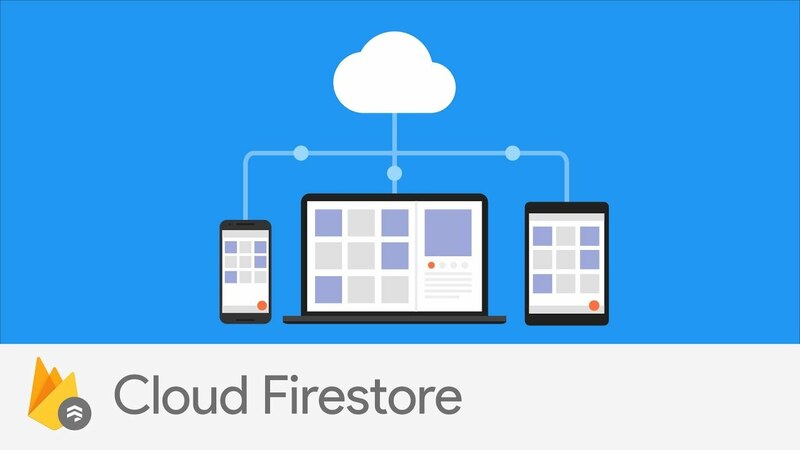 In order to actually use Cloud Firestore we need to create a new Firebase project that our app can connect to. To do this, go to the firebase console, click on ‘add project’ and fill in your project name. Once your project is set up, click on the ‘Database’ tab and activate Cloud Firestore. For now we’ll go with “start in test mode” which allows everyone (including us) to read and write to our database. When your app goes to production you should definitely consider changing your security rules to something more sane (learn more about security rules here), but for our purposes this is good enough. The last thing we need in our console is our config data. For this, go back to ‘Project Overview’ and click on ‘Add Firebase to your web app’. From the popup you’ll need to copy just the content of the config object. With that we can head back to our project. Now we’re all set and done and can start building our Firestore app! We want to create a blog app where one can write posts (create), display them (read), rate them by giving likes (update) and deleting them again (delete). If you want to see the finished result, here is a live demo and a github repo. Let’s start by creating a component to manage our posts and a Firestore service to add them to our database. The manage-posts-component will be used to create and delete posts, the view-posts will read and update them. We’ll add the likes later. Next let’s build a form in the manage-posts-component to create our posts. The only thing left to set up is our post service that communicates with Firestore. But before that let’s first talk about how Firestore structures your data. Note that the document can then be accessed at the path 'posts/:postid' . Later we will get to how t o access the document ids. These collections and documents contain all the methods that we need to implement our CRUD operations, so let’s get started! Pretty straightforward, right? The drawback is that you only get the posts themselves without any metadata like their id, so you can’t actually make any updates to the documents themselves. ValueChanges() is good if you just want to display your data, but most of the time you’ll need something more sophisticated. Now that we can display our posts and reference their corresponding docs by their ids, we can easily build in the like-functionality. First let’s create an update method in our Post-Service. Then we’ll fix the call of our add method so it initializes all posts with zero likes. And add a like method that increases a post’s like counter by one. And that’s it! We sucessfully implemented CRUD operations with Firestore. Again, you can check out the live demo of the finished post app, or check out the source code on github. As we have seen in this tutorial, it’s really fast and easy to get started with Cloud Firestore. Moreover, the AngularFire2 wrapper makes it a great fit for use in Angular projects. Thank you very much for this tutorial! Was a tremendous help in understanding how to get the document id and all the logic around it.